Intimidated out of his childhood home at just seven years of age. For a frightened and bewildered young John White, it was, quite literally, out of the Ballybeen frying pan and into the Short Strand fire as the flames of sectarian hatred engulfed 1969 Belfast. Now aged 55, he can still recall vividly, as you would, boyhood nights spent hiding under the blankets in his bed as gun battles raged around the east Belfast nationalist enclave between warring local republicans, their loyalist neighbours or the Army, and sometimes all three. He can recite the names of friends and neighbours cruelly and randomly murdered, like so many others at that time, simply because they met the three deadly requirements - religion, wrong place and wrong time. On one particularly ghastly 1972 night, he recalls how his house shook as a prematurely exploding bomb claimed the lives of eight people on nearby Anderson Street. Those are the kind of all too common Troubles experiences that marked many children for life, drove them as teens into the ranks of the paramilitaries and onward to prison - or worse. So what kind of man did the traumatised young White grow up to become? Remarkably, through a love for football in general and Manchester United in particular, you discover, he emerged from the mayhem as well adjusted an adult as you are likely to find and without a trace of bitterness for all he endured. That is obvious when you meet the chatty Department of the Economy civil servant who immediately comes across as a man always on a mission, who not only believes he can make a difference but who actively does. Like his father before him, he married across the divide in much more polarised times. And in 1991, with the smoke still coming out of the guns, he came up with the previously unexplored notion of a truly cross-community football supporters' club whose members would be united by a shared passion for the Old Trafford club. Little did he realise then how that would pan out in the form of an unlikely and undreamed of friendship with the world's most famous football manager at the peak of his Manchester United powers. Sir Alex Ferguson would become a regular visitor to White's family home, now in Carryduff, and on one memorable occasion even stopped off on the way there to place a bet in a bookies in the Short Strand. White, in turn, was invited to become the Northern Ireland representative of Fergie's personal charity, named after his late mother, the Elizabeth Hardie Ferguson Charitable Trust, helping raise many hundreds of thousands of pounds for sporting causes, many of them locally. His pal and idol, who he calls The Boss, opened doors for him to sip champagne with Eric Cantona, banter with Paul Gascoigne and rub shoulders on first name terms with some of the biggest United stars. If all this sounds like a script for a book, that's because it is. Not a work of fiction but White's autobiography of his Manchester United love affair, an engrossing and engaging tale, that deserves to be told, of knockabout fun, serious football supporting and good works against a dark Troubles backdrop. 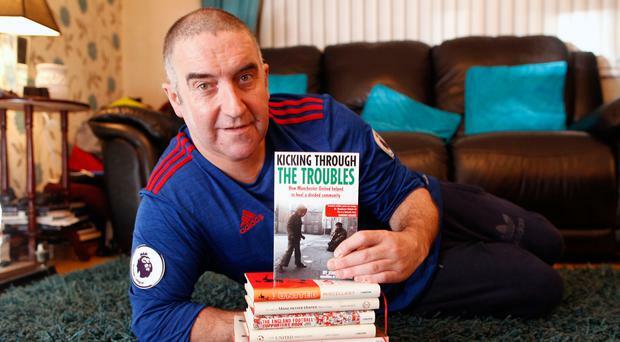 He has entitled the tome Kicking Through The Troubles (How Manchester United helped to heal a divided community) and it is a book that can truly be judged by the cover. With friends, family and fellow supporters name checked for verification at every turn, it comes across as a believable record of an extraordinary journey. White is well known as the founder member of the massive Carryduff Manchester United Supporters' Club, Ireland's biggest with 400 members, north and south. But even though this avid writer has penned 18 books, mostly Man U related, his own eventful back story has never been documented until now. In a way it is a social history of his working class generation that many who remember the outbreak of the Troubles and the upheaval that followed will relate to. It is not intended to be a thesis, though. "I just wanted to share the story of my love affair with Manchester United," he explains. "It is no ordinary story, I admit. To put it in context, I needed to bring in the background of my life growing up in the worst of times here. "I am a Belfast boy who grew up during the Troubles and in my life I have experienced many changes, some good and some bad, but apart from the love of my family I have always had one constant in my life -Manchester United. "I am extremely proud to say that I got to know Sir Alex Ferguson - a man I still call 'Boss' - so very well. I will forever cherish those truly memorable moments I had in his company." White's book is not just about how he got to know The Boss. It is a rite of passage that begins as his late father, a Protestant, and his Catholic mum set up home in the then mixed Ballybeen estate in Dundonald after John's birth in 1962. He recalls an idyllic childhood, playing football in the street, oblivious to religious identities and attending an also mixed Carrowreagh Primary School. That all changed as widespread communal strife ignited with the street battles of 1969 and in a way the young White could not comprehend. "A window cleaner came to our house one day and spotted a crucifix my mum had placed on a wall," he relates. "Suddenly there was a change in attitude and not long after that we were told to leave." Family in Short Strand took them in and there he remained as murder and mayhem reigned all around through his formative years from which he emerged astonishingly unaffected in outlook. He tells in the book how he crossed barriers to meet and marry wife Janice, moving together to Carryduff because "there were no flags or painted kerbstones". He did, however, flag up his own red religion by naming his first house Stretford End! Neutrality was the vision, too, as he placed a newspaper advert in 1991 inviting fellow Reds to a meeting at Maysfield leisure centre with a view to forming a cross-community supporters' club. "It was a big ask with people still in their trenches and we needed 40 to be recognised by the club as a branch," he recalls. "I stood in front of the 44 who turned up and outlined my dream after which 18 signed up. We were still 22 short but by the time of the next meeting, we had our quota and it all grew from there." White is proud of how the Carryduff club multiplied ten-fold over the next decade, providing affordable trips to Old Trafford for genuine fans from all parts while raising countless thousands for charity along the way. "We have members from the Shankill and Falls, from virtually every town in the north and extending to Donegal and Dublin," he outlines. "We travel together, laugh together, celebrate together and sometimes drown our sorrows together. "I feel proud when I look at the membership list and see three generations of United supporters, with kids and grandkids of the original founders involved. "We also have the only official junior Manchester United supporters' club in the world, named after Sir Alex." Like many of his own generation, White's love affair with United was sparked by a certain George Best. He tells of being taken to Windsor Park by his dad to see George score a hat-trick in a 5-0 Northern Ireland win over Cyprus in 1971... and an enduring obsession with all things United was born. White would have been content running his club and attending games as a 5-8 supporter until a quirk of fate took his relationship with the seemingly unreachable Ferguson onto a new plane. Again, his organisational mind played a part. "Five and a half hours is a long time on a coach from Cairnyan to Old Trafford," he explains. "So when the club were travelling to matches, I would devise quizzes. By the end of the season I had a couple of hundred questions and answers and decided to put them in a book. "I hawked it around a load of publishers but there were no takers. Around the same time I was attending an annual supporters' club conference. The Boss was there and I thought, nothing ventured, nothing gained. I left the draft of the book with him, asking if he would consider writing a foreword, and to my astonishment he got back a few weeks later, saying he would be delighted. Suddenly, there was a surge in interest, the book was published and that was my introduction to Sir Alex." They kept in touch and the relationship moved onto a firmer footing when Ferguson later appointed White to his charitable Trust. Regular visits to Belfast and Carryduff for fund raising functions followed (if Ferguson couldn't come personally, he sent players of the calibre of Giggs, Scholes and Neville) and it was on one of those trips that Fergie brought the Short Strand to a standstill. "We picked him up at the City airport to take him to Carryduff but he immediately said he had a horse, Queensland Star, running at Newmarket," White recalls. "He wanted to get to a betting shop to see the race and get a few quid on. The only bookies I knew was the one my dad frequented in Short Strand, so I took the most famous football manager in the world there. "Three thousand people live in Short Strand and as word spread, about two and a half thousand besieged the place. Sir Alex signed hundreds of autographs on betting slips in good humour. Unfortunately, his horse finished second." Runner-up was an unfamiliar position to Ferguson during his United glory reign that provided White with an abundance of memories he shares in his book. His favourite United moments are spread over the 10 days in May 1999 as the famous Treble was won. White followed every step of the way from the clinching of the league title against Spurs on a Sunday, to the FA Cup final win over Newcastle the following Saturday and on to Barcelona for the incredible 'name on the trophy' Sheringham and Solskjaer two-goal finale to wrest the Champions League trophy from Bayern Munich. He lists his top players as Best, Cantona and Robson. "I used to light candles in chapel to pray Robbo would stay fit," he laughs. One of the great stories, though, is of the night of Cantona's farewell testimonial at Old Trafford. White and two Carryduff clubmates are spotted walking away from the ground by Ferguson who packs them into his car and delivers them to the Cantona after-party, seating them at the legend's table, surrounded by superstars. In his foreword to the book, United great and another close pal of White, Paddy Crerand, writes: "I was standing talking to Bestie and remember thinking 'How the hell did these three manage to talk their way in here?' as I watched them enter the function room from behind these enormous red curtains. But then knowing John, I had a fair idea it had something to do with Sir Alex. And I was right! "The Three Amigos certainly availed of the free champagne and food and I even recall John nattering away to Paul Gascoigne and Graeme Souness." White's study at his Carryduff home is a temple to his United obsession. One of his proudest possessions is Ferguson's first managerial trophy, presented by the Manchester Football Writers after his first trophy win for United in the 1990 FA Cup, and handed to White as a keepsake. He has two sons Marc (27), named after Mark Hughes, and Paul (24) after Paul Ince. Both are also United followers and Carryduff members. Family, he insists, is of paramount importance to him. He has no idea how much he has spent indulging his football passion or how many hours a week he pours into the Carryduff club and his United projects. All he knows is that it has been worth it on a sporting and personal level. The point of his book, he concludes, is to show: "It is time we put the past firmly behind us and not be bound by its shadow. I have seen how Manchester United can help heal a divided community when men, women and children from across the religious divide put politics and religion behind them and bond together as one. United are the proof that Ireland is neither green nor orange, it is Red!" l Kicking Through The Troubles available from www.amazon.co.uk. Hard copy £10.00 direct from Empire Publications, Manchester (Tel: 0161 872 3319) with free post and packaging. Waterstones, 44-46 Fountain Street, Belfast.